Posted February 15th, 2018 by Jeremy Dalton. Do you want to make your homes smarter and lives better? Then, you must invest in high-quality electronic systems, especially a home theater system. These can make your homes technologically sound and give you a better experience for watching movies. 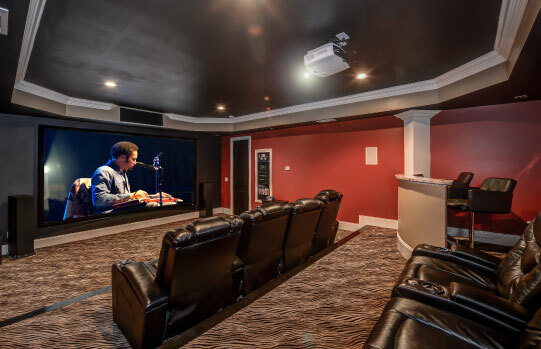 We, at Atlanta Entertainment Systems, can offer you the right combination of acoustics, light-control, electronics, and aesthetics that contribute to an amazing home theater experience. We have professionals to ensure that you enjoy a perfect functionality and performance from home theater installation and our simple remote controls will give you an easy-to-use experience. So, if you want a state of the art entertainment zone right in your house, you should resort to us. But how can you make sure that you have chosen the right company for your home theater systems? Here are a few factors to consider. Take a look. Old-fashioned technology is no good. So, you have to check that the company you have chosen to buy your home theater system provides you with the updated and latest models which can enable you to enjoy all the modern features and benefits of this kind of a system. The fact that a company has faith in its products ensures that you will not have any issue in the near future about the functionality of the product. And this faith is rightly evidenced by a good warranty for a substantial period. If they cannot provide a warranty, it indicates they are not sure about their own products. A company that understands the budget constraints of their customers is the right choice for you. The company should price their products reasonably so that everyone can afford such a highly technological equipment and enjoy its benefits. So, if you live in areas like Atlanta, Brookhaven GA, Buckhead, Griffin GA, Marietta, or McDonough and think that we are the right choice for your home theater systems, don’t delay any further and get in touch with us now.